the muscles between the thorax and the pelvis supporting the abdominal wall. The lateral parts of the wall are formed by the transverse abdominis, the internal oblique, and the external oblique. Anteriorly, on each side, a segmented muscle, the rectus abdominis, spans the distance between the inferior thoracic wall and the pelvis. 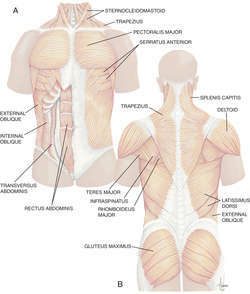 Other muscles supporting the posterior aspect of the wall are the quadratus lumborum, the psoas major, and the iliacus. The large muscles of the anterior abdominal wall—external oblique, internal oblique, rectus abdominalis—which help breathing, support spinal muscles whilst lifting, and help maintain abdominal organs and GI tract in their normal position. layers of muscle in the abdominal wall. The rectus abdominis muscles, strap-like, lie vertically each side of the midline; their action can be important in breaking the force of a blow. A 'three-ply' layer of flat muscles, each with the fibres running in different directions (external and internal oblique, and transverse) extend from the lower ribs to the hip bone, and from the sheath of the rectus muscles to the lumbar spine, thickest in the flanks. 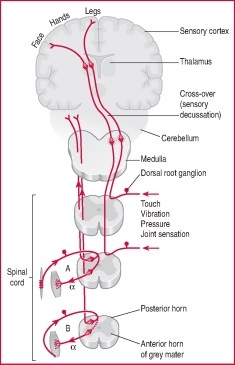 Actions include: forward flexion and rotation of the trunk; assisting expiration during deep breathing or against airway obstruction, by contracting as the diaphragm relaxes, or acting together with the contracting diaphragm to raise abdominal pressure in straining (urination, defaecation, childbirth) and in vomiting. Figure 1. To the best of our knowledge, there is a lack of studies about the characteristic of the lateral abdominal muscles in AIS patients. Evaluating the symmetry of abdominal muscles in mild AIS by ultrasound, Linek et al. This is the first study, to our knowledge, to stimulate abdominal muscles with four bilateral sets of surface and implanted electrodes along the midaxial line and to use conditions of simultaneous channel stimulation with a high current of 100 mA per channel or 400 mA total for four channels. Although this finding is only statistically significant for the pre-season measurements on OI, all other activation findings for OI and TA during the ADIM show that the abdominal muscles on the non-dominant side are activated at a higher rate than the dominant abdominal muscles. JACK KNIFE SIT UPS A jack knife sit up is a more complex sit-up, involving all abdominal muscles. Close clinical manipulation confirmed it to be congenital abdominal evisceration with failure of retraction of a part of peritoneum and intestinal loops through mid ventral abdominal umbilical opening which should had been apposed during abdominal muscle apposition at the time of gestation during foetal development. Lying on your back, tighten your abdominal muscles and do a pelvic tilt. By varying the position of the upper extremities different degrees of difficulty or resistance is obtained for the abdominal muscles. Pilates exercises are one of the best forms of core strengthening that work overall on back muscles, oblique and abdominal muscles as well as legs," says Dalmiya. TARGET AREA: This exercise strengthens the hip flexors and abdominal muscles. True core power comes with awareness and co-contractions of several deep, internal muscle groups: the pelvic floor, or low abdominal muscles that provide the base of core support; the transversus abdominus (TVA), or innermost abdominal muscle, which runs like a corset between ribs and pelvis; and the deep spinal extensors (lumbar multifidus), which lace up between vertebrae. They may believe that inhalation should be very relaxed, but what they actually do is create a resistance with the abdominal muscles, and inhale against it. Dispelling Vocal Myths. Part 1: "Sing from your diaphragm!"